Animal Defense League of Arizona (ADLA) is kicking off Fall for Felines! From the first day of fall (9-21) to the last (12-21) we will be highlighting the importance of trap, neuter, return (TNR) – the most humane and effective solution to reduce the number of cats living on Valley streets. Although ADLA’s Spay Neuter Hotline Program provides TNR services all year long, we hope to bring some urgency and energy to the effort now. ADLA is asking you to get involved! 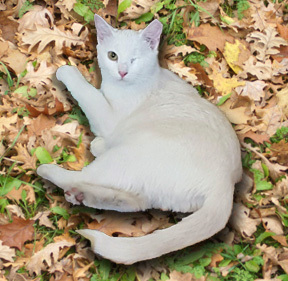 How can you participate in Fall For Felines? It’s starting to cool off; It’s more pleasant to be outside. There are fewer kittens and nursing Moms on the streets. We want to prevent as many unwanted litters as possible before kitten season begins (cats may start going into heat as early as December or January- depending on the weather). Because of our warm weather, cats reproduce more litters than they do in colder climates. There are many ways to “fall” for felines. First, if you care for an outdoor cat that is not spayed or neutered, contact ADLA’s Spay Neuter Hotline to make an appointment. Visit the ADLA Outdoor Cats page for more info and to request an appointment. Volunteering is another great way to help felines! Fill out and submit the volunteer form and ADLA’s staff will contact you with all of the exciting opportunities you have to help the outdoor cats in Maricopa County this fall. It can cost as much as $40 to spay or neuter one cat and our goal is to trap, neuter, return 2500 outdoor cats between now and December 21st! Please consider a donation to help us reach our goal.